LEARN the comprehensive model and skills to take any conversation deeper than anyone could have imagined, to the essence of what needs to be seen. The 7 Stages of Circling form the foundation for our entire training course and will provide you with both a breadth of new understandings and insights as well as usable tools you will be able to apply to your own life the next day. And how to access all 7 Stages of Circling, to discover and tap into that place of depth in someone, to co-explore what matters most, until something new emerges into existence. 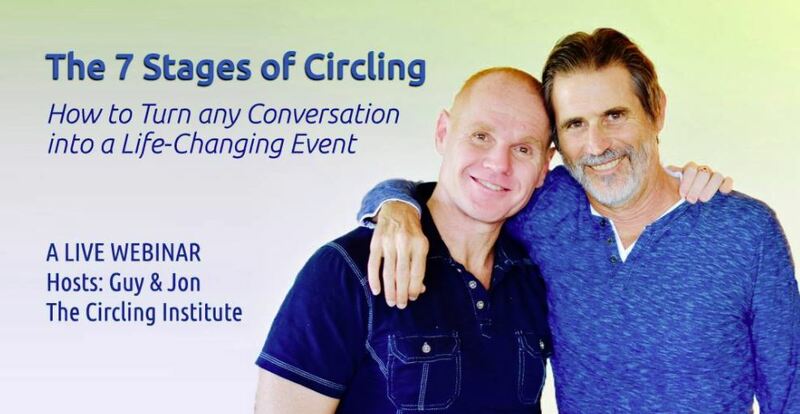 Learn from Circling Institute partners Guy Sengstock, the original founder & genius of the now worldwide practice of Circling and Authentic Relating and Jon Cotton, a master circler with 30 years of experience teaching meditation, intuition & psychic abilities, firewalking, intimacy, & numerous other modalities. They will provide you with a richer understanding of circling and relating more deeply with everyone in your life. They will also demo the skills with a laser circling sessions with a participant. Expect to have fun, expand your capacities & skills, and get your questions answered. Plus, there will be special bonuses for everyone who signs up to watch the Webinar, including a valuable FREE offer & gift.